Beretta, Browning, Bushmaster, Colt, Diamondback, Federal, Glock, Heckler & Koch, Henry, Hi Point, IAC Hawk, Karr, Kel-Tec, Kalashnikov, Mauser, Mossberg, NcStar, Remington, Rock Island, Rossi, Ruger, Sig Sauer, Smith & Wesson, Springfield, Taurus, Weatherby, Winchester, Walther, and more! Stop in today with your quality used firearm and ask us how much we will buy it for. Or, if your finances could use some help this month, we can loan you the money you need with your gun as collateral. Either way, we are here to help you get the money you need. All gun loans are for 90-days where you would pay back the principal plus interest within that time frame. You could also payback just the interest which would renew your loan for another 90-days. If you can’t pay back the gun loan in full at its maturity, you may surrender the gun as full payment with no further obligation on your part. Why take out a loan on your gun? Why not? 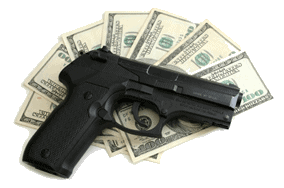 If you need cash but perhaps your credit isn’t good or you have no credit, then taking out a pawn loan or collateral loan based on the value of your gun could provide you with the money you need when you need it most. It really is as simple as that. If you need cash, but don’t want to sell it and have it be gone forever, it’s a good idea to use our loan services. Stop by in Casa Grande so we can evaluate your gun. We would then write up a 90-day loan and you would receive cash. Don’t forget we also serve, Coolidge, Maricopa, Eloy, Arizona City, and the Florence Area.